3176c, Used Rims, 15X6, 5 LUG, 4-3/4", 96-98, MERC, FORD, SABLE, TAURUS, 14 SPOKE PAINTED SPARKLE SILVER ALUMINUM. 4593, CENTER CAP USED, 05, CADILLAC, SRX, SPARKLE SILVER PLASTIC CAP, 14 RAISES TO MATCH SPOKES, RAISED CREST AND WREATH LOGO, 6 SETS OF PLASTIC CLIPS, 6-1/16" DIA. FOR A 17", RIM, ALSO FITS 4580 RIM. 489C, Hubcaps used, 15", 93-95, CHRYSLER, DODGE, PLYMOUTH, CARAVAN, DAYTONA, LE BARON, SHADOW, SUNDANCE, 14-SPOKE TYPE, NO LOGO, WHITE. 494, Hubcap used, 14", 94-95, DODGE CARAVAN, MACHINED, CHARCOAL POCKETS, 14 SPOKE TYPE. FAKE LUG NUTS, PLASTIC CLIPS & WIRE RING. 494=14" 489b=15"
5358, Used Rims, 22X9, 6 LUG, 5-1/2", 07-10, CADILLAC, ESCALADE, ESCALADE ESV, ESCALADE EXT, OPT S85, CHROME, 14 SPOKE (7 DOUBLE SPOKE), ALLOY. 55036, Hubcaps used, 14", 95-97, HONDA, ACCORD, SILVER, 14 SPOKE, 4 LUG NUT HOLES, ETCHED H LOGO, HELD ON BY LUG NUTS. 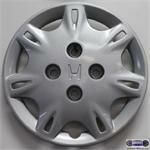 55087, HUBCAP USED, 15", 10-11, HONDA, INSIGHT, 14 SPOKE, SILVER PAINTED, ETCHED H LOGO, PLASTIC CLIPS, WIRE RING. 57563, HUBCAP USED, 15", 99-03, MITSUBISHI, GALANT, SPARKLE SILVER, 14 SPOKES. HAS 7 DOUBLE SPOKES, 5 FAKE LUG NUTS, ENGRAVED LOGO IN CENTER, 7 PLASTIC CLIPS & WIRE RING. 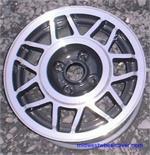 60525, Hubcap used, 15", 95-98, SUBARU, LEGACY, SPARKLE SILVER, 14-SPOKE. [ LARGE & 7 SMALL, ENGRAVED WORD SUBARU IN CENTER, PLASTIC CLIPS & WIRE RING. 61548, Hubcap used, 15", 04-05, VOLKSWAGEN, PASSAT, 14 SPOKE TYPE, SPARKLE SILVER PLASTIC CAP, 7 ROUND HOLES, CHROME RING, BLACK BACKGROUND, CHROME LOGO, 7 PLASTIC CLIPS. 69637b, Used Rims, 14X6, 4 LUG, 100mm, 86-87, VOLKSWAGEN, GOLF, 14 SPOKE, GRAY METALLIC PAINTED, 162mm CENTER CAP, ALLOY. 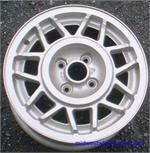 69637c, Used Rims, 14X6, 4 LUG, 100mm, 86-87, VOLKSWAGEN, GOLF, 14 SPOKE, ARGENT PAINTED, ALLOY.